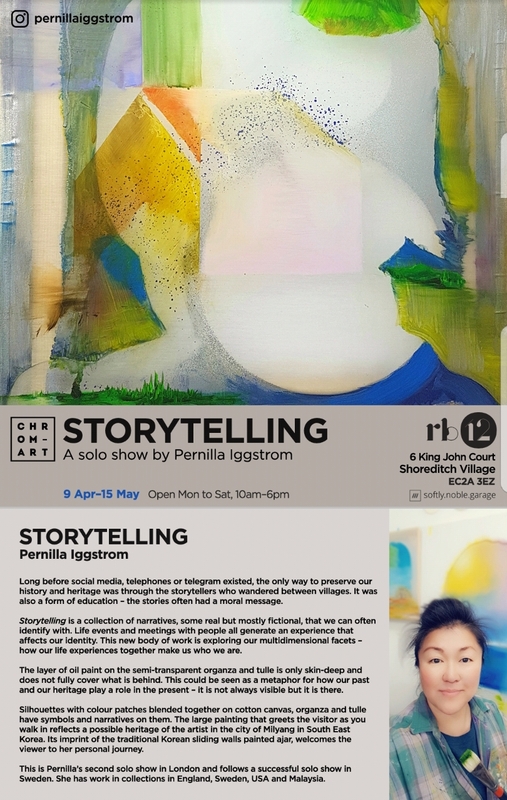 Pernilla is pleased to welcome you to her third one-person show Storytelling at rb12 in Shoreditch, London. Storytelling is a collection of both real and fictional narratives inspired by the artist’s journey from Korea via Sweden, back to Asia and finally England where she is based today. Some of the paintings have layers of oil paint on semi-transparent surfaces which invite us to see past the obvious - the unsaid or unknown beyond the seemingly apparent. Perhaps a metaphor for how our past and our heritage play a role in the present – it is not always visible but it is there. Storytelling has been made possible thanks to rb12 and Chrom-Art, a London based international art platform dedicated to supporting emerging artists. The exhibition runs from 9 April to 15 May, 2019, Monday to Saturday 10am to 6pm. Saturday 27 April, 2pm- 3pm - Talk: Pernilla will share how her multicultural background informs her art practise, followed by questions and discussions.